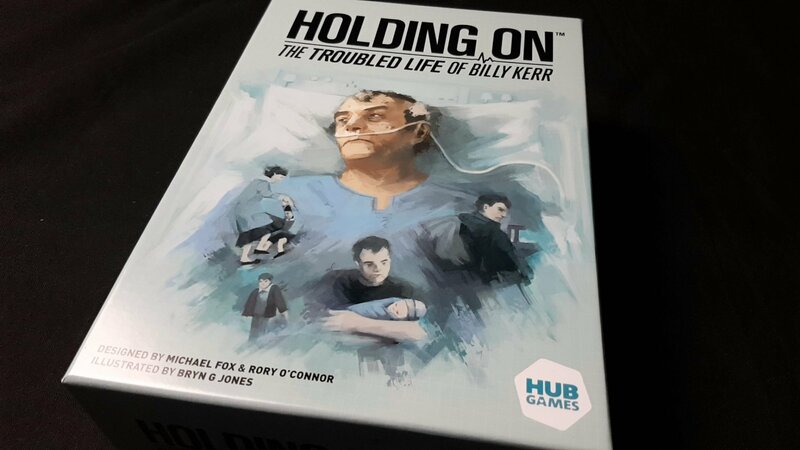 A review copy of Holding On: The Troubled Life of Billy Kerr was provided by Hub Games in exchange for a fair and honest review. I haven’t celebrated a birthday since. He died at home, surrounded by the people that loved him. The cancers, brain and lung, took him with a Blitzkrieg-like swiftness. We’d been told at the time of his diagnosis that he had about six months left to live. He died after three weeks, leaving behind a hole in our lives that would never really be filled. Holding On: The Troubled Life of Billy Kerr has been a hard game for me to play. Focusing as it does on palliative care for a man who has an unknown quantity of life left to live, it repeatedly made me think of my father in a context that I hadn’t for a long time. He died twenty years ago – the pain is still there but it long ago lost the raw, sharp edges that come from something important being suddenly and violently ripped away from where it should be. You get better at carrying absences with you in your heart. You never really fill them. Every so often though something happens that reminds me that there are still jagged edges in that roughly hewn hole. Edges that can even now cause me to bleed from the inside. I haven’t played Holding On to the end of its scenarios. I don’t really think I can. My father was a wonderful man, and I see him reflected back at me in the face of Billy Kerr on his deathbed. First of all I want to point out that Holding On is an incredibly brave game. This is territory that is rarely explored in game design because it’s often hard to work out where the fun can possibly be found in the concept. I don’t think I can call Holding On fun in its most traditional sense. I’m not sure really it’s supposed to be. Holding On perhaps isn’t fun, but it’s worthy. It made me think of my dad every time I looked at my shelves and saw the box sitting there. It’s created a constant low-grade distortion in my emotional landscape. Its narrative weight has radiated out from my game collection and pressed down on me since I collected it from the postal delivery. Perhaps surprisingly, playing it is less emotionally affective than the fact of having played it. Holding On rarely made me think of my father during play. There’s too much to do, too much to worry about it. The core of Holding On is a brutal satire on the care economy, and the powerful personal cost of emotional labour that props up the National Health System at every level of the institution. Bill Kerr doesn’t die surrounded by his family. He doesn’t die surrounded by his friends. I’d say he dies alone, but in the end that’s what we all do. Billy Kerr dies as a burden on a system already stretched to breaking point by a government that seems to have had some key part of its compassion surgically removed. We might wonder why this would be – why should Billy Kerr die in an NHS ward rather than his own bed? That’s essentially what the game is about – it revolves around the gradual revelation of a personal history that explains the situation. There’s only a little text in the scenarios of Billy Kerr but by and large they say everything that needs to be said. Billy is a guarded man, steeped in the politics and darkness of the Irish Troubles. Each fragment of his life story has to be repeatedly brought forth and examined for anything to gain meaning. That’s done through a system of memory interrogation that relies on the effective leveraging of time, care and opportunity to bring forward the misty memories of the past that mark the key moments of Billy Kerr’s life. We first played Holding On at the UKGE 2018 convention. In our roundup of the event I talked about how we approached the end-of-life care of Billy Kerr with all the gentle compassion of a CIA black-site extracting time-sensitive testimony from the captured agent of a hostile power. That was easy to do in a convention where the high spirits and energy of the day lend a cheerful detachment to the affair. In the relative intimacy of our home kitchen table, the game takes on a different kind of ambiance. It’s a powerful simulator of bureaucratic impotence that creates an almost oppressive sense of hopelessness. 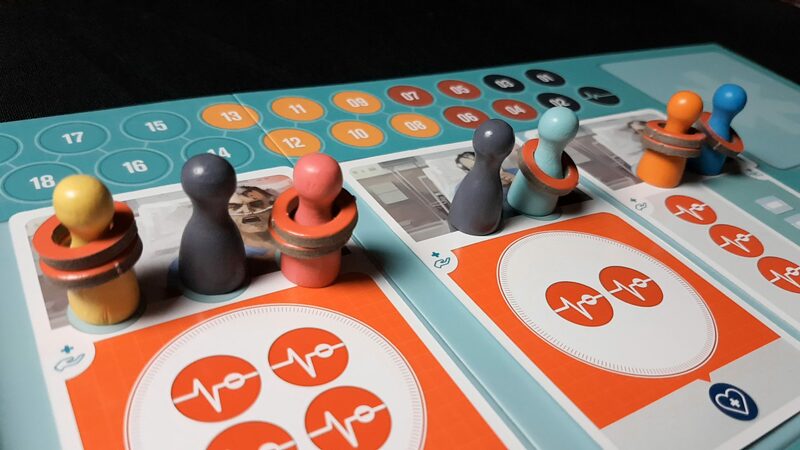 Holding On’s tempo of play is built around the revelation of cards that reveal the medical circumstances of the current shift – three in a day. You only get these one at a time, and your job is constantly one of triage. You have a set medical staff and a couple of on-call assistants who can be used once before they disappear. Everything else has to be funded through a budget of stress and carefully selected incidents of intentional neglect. Billy must receive medical care every day, or the hospital will receive an improper care warning. Two of those and the game ends, presumably with Billy’s transfer from imperfect medical care to the perfect disinterest of the grave. Every scenario has its own win condition, and it usually involves the matching of unclear memories to their high definition equivalents. Unclear memories represent a kind of ‘previously explored ground’, and the clear memories are the life vignettes you get when you dig a little deeper into the stories he’s already told you. Sometimes your job is to build up a breadth of stories. Sometimes it’s to find specific memories relating to where you are in the exploration of Billy Kerr’s eponymous troubled life. The problem with all of this for you is that this gameplay system is designed to mimic the rambling, troubled disclosures of a private man in distress imparting often troubling life history. Unclear memories are picked up irregularly as a reward for neglecting Billy’s medical or palliative care. Clear memories are available only occasionally and they require the medical staff to expend their own energies to gradually fix the stories on their true rail. Unclear memories are the unfocused, spontaneous revelations of a man mumbling into the dark contours of his own psyche. Each one is a string that you can follow to find a real event that can be teased out with conversation, but only unreliably. Whether you can find the clear memory depends on random card draws – if you don’t have the unclear memory that matches you need to keep digging. Sometimes with the certain knowledge that this might have been the last time you could even care enough to ask. 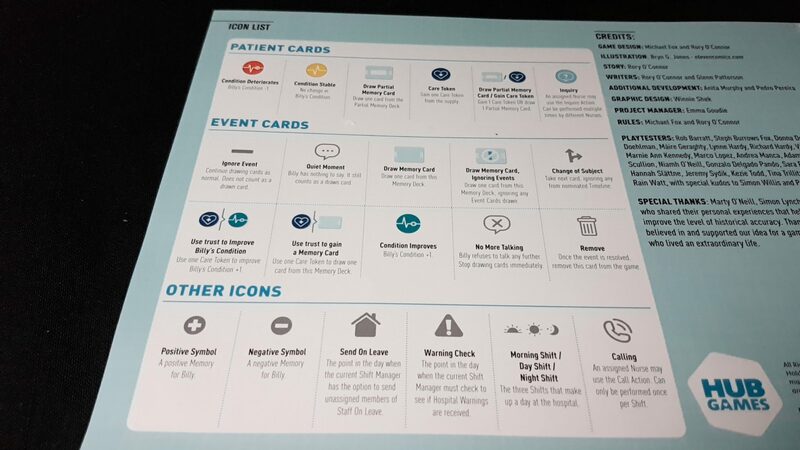 Every single shift in the hospital requires an act of emotional balancing between often contradictory requirements. You need to juggle necessity of medical care, the desirability of building up a well of connection and empathy, and the development of a matrix of memories that give you a reasonable chance to pin any of them down into a form that lets you accomplish anything. You never have enough staff to do everything, and Billy’s deteriorating medical situation means that you can have days where all you can do is stare in helpless despair as he accelerates towards death. 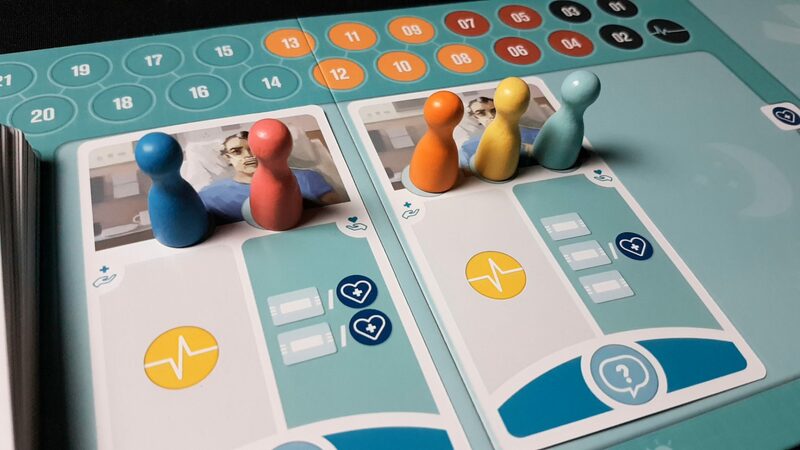 To deal with staffing shortages, Holding On gives you a system of stress management that is brutal in its damning satire of Conservative health policy. Your doctors and nurses constantly carry around chains of stress, weighted around their necks like manacles. This stress only comes through overwork – by covering extra shifts or covering for colleagues that can’t be present for the current shift. Once a certain amount of stress is gained, over-stressed staff are sent on forced leave. That means that the next day is almost certainly going to result in a huge amount of extra stress being heaped onto the already burdened shoulders of those left behind. It’s the model of weaponised burnout that keeps our NHS functioning. You try to avoid a circumstance where anyone is actually give the time for self-care, because years of chronic underinvestment have led to a staffing model that works only through the self-sacrifice of its workers. Nobody can ever take a personal day, because stress is contagious and its epidemology can only be contained if it’s spread over a large enough pool of people. 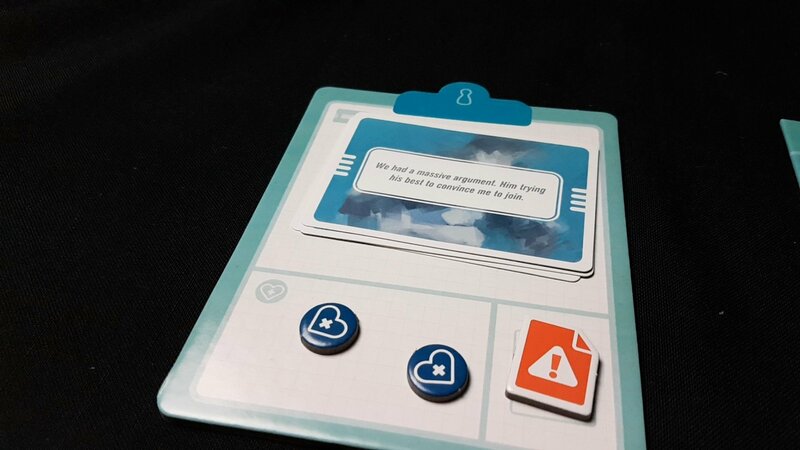 You have just enough medical care spread through your team to see to Billy if your time is always spent optimally and the worst cards are reasonably leniently distributed through the deck. One single additional pawn would ensure everything runs smoothly, but modern industrialised medicine is built on the precarious ledge between feast and famine. Your job is to balance there without falling. The day after my father died, a couple of nurses arrived to deal with the grim but necessary realities of tidying up after an ugly passing. I don’t recall why I was in the bedroom where he died at the time, but one of the nurses had clearly forgotten I was there. ‘Lifelong smoker’, she shrugged. ‘His own fault really’. The other nurse darted her horrified eyes to me and there was a moment of silent awkwardness. It struck me at the time as unforgivably callous – to sum up a complex life with such a small, smug epitaph. This mean-spirited summary didn’t give any time for considering the complexity behind what being a life-long smoker meant at the time. There was no room for integrating the working-class pressures and merchant navy traditions that led to his addiction in adulthood. He was a professional gambler for a time, and I suspect the stresses and pressures of that lifestyle weren’t exactly conducive to giving up. My father had ran away and joined the merchant navy to escape an unhappy homelife, and many of his later unhealthy practices stemmed from that. And yet, it doesn’t explain the whole. He was more than just a life-long smoker. More than just a death statistic. He had few vices. He never swore at home. He was a tee-totaler for my entire life. He frequently tried to quit smoking. It wasn’t easy for anyone at the time. The best he could do was make sure that I was well aware what would happen to me if I ever took up smoking myself. I never did. A few weeks earlier we were in the unhappy position of discussing our scant roster of futile options with one of the primary care doctors. We got no useful advice. Instead we got constant shrugging of the shoulders and regular glances at a watch from a doctor that clearly didn’t care and would rather be anywhere else than in a house wreathed in sadness and hollow desperation. Again, that was something that struck me as incredibly cold-hearted when dealing with a family still aflame with grief. I’ve come to understand better over the years that compassion exacts a merciless toll. As raw as the wounds were, they were our wounds. The world hadn’t ended for anyone but us. I don’t resent the callous actions now, but rather the lack of discretion. Their only real sin was not adequately hiding the shields that stood between them and their work. That shield gets heavy, and sometimes it slips. Holding On models the need for emotional distance by forcing you into the position of being a cynical and detached optimiser of palliative care. With Billy you either intervene medically or you sit back and let his memories flow over you. The act of not healing is the one that grants you the care tokens you can use to later inquire about Billy’s life. They’re little markers of breaks you’ve taken in the day to give you the necessary psychological distance to simply care about what happens to Billy. In Holding On, the easiest way to fail is to simply focus on him as a patient. You need to leave yourself enough breathing room to think of him as a person. I will always remember that nurse describing the passing of my loving father as a ‘a lifelong smoker, what can you expect’. What that really shows though is someone lacking the spare emotional capacity to consider what that descriptor left out for his grieving son as he watched from the corner of the room with eyes still red from grief. Even though I was a newly minted twenty-one year old man, I still can’t remember a time where I felt more like a helpless and rudderless child. It had been probably ten years since I had thought of that incident. Holding On brought it back to me. I haven’t really had fun with Holding On, but I’m not sure that was ever the point. I’m not sure I ever could. It’s hard to extrapolate much from my personal reaction to Holding On. Nobody gets through life without being hurt, and that at least is something where we all have a connection. Whether the scabs over your own personal damage are going to be unpicked quite so neatly is something only you can decide. I remarked on Twitter a few weeks ago I was going to review the game soon. A number of people replied with comments along the lines that suggested they themselves had avoided playing because of the worries that come along with the subject material. Holding On could have so easily have been a game with an inoffensive theme – one of ‘comedy’ rather than ‘desperate’ stress. Fulfilling stationary orders in The Office. Making whoopie cushions in a factory run by a pitiless cyborg. Doing a crossword while a cruel cruciverbalist gives you new clues only after you have seen to their erratic whims. The game itself, with its balance of stress and accomplishment, is a solid core upon which to build a whole range of experiences. That Hub Games have gone with this framing is remarkable – it’s genuinely brave to create a game that threatens to stab you right in your most vulnerable places. It might even have been commercially foolish to couple an effective game system to such a raw element of narrative, steeped as it is in themes of violence, death, estrangement and despair. Even if it was just marketed as a game about the NHS it could have been pointedly satirical without being potentially upsetting. Holding On plays with live grenades, and for a lot of people they’re not going to take the risk of the shrapnel. But isn’t this exactly the kind of game that we should celebrate? We spend so much of our time as game reviewers bemoaning the lack of inventiveness in thematic framing for games. Goblins and orcs. Trading in the Mediterranean. Zombies. We have thousands of games where clever mechanics are left shackled to uninspiring themes. 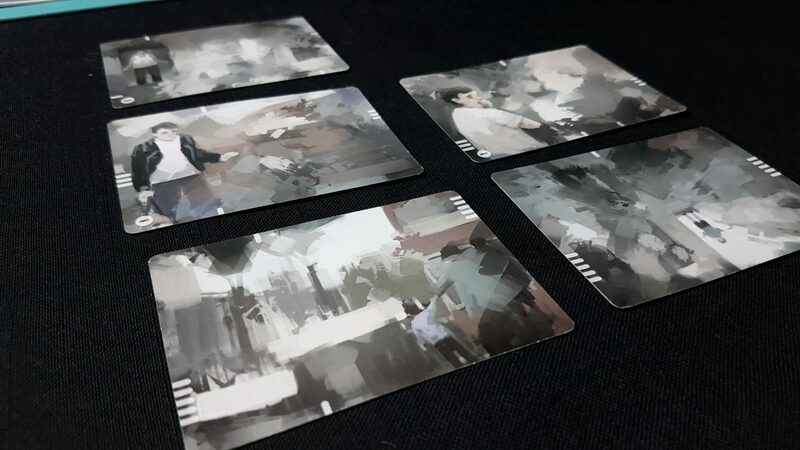 Games like Holding On might be what’s needed to kick this hobby into a higher gear – to show that emotionally affective stories can be told through the medium of board games. Once upon a time Electronic Arts was a company with dreams. They wanted to know if a computer could make you cry. This was back in the 80s, before they effectively answered the question themselves through excessive monetization of their gaming franchises. Video games had been dismissed as empty, facile experiences. 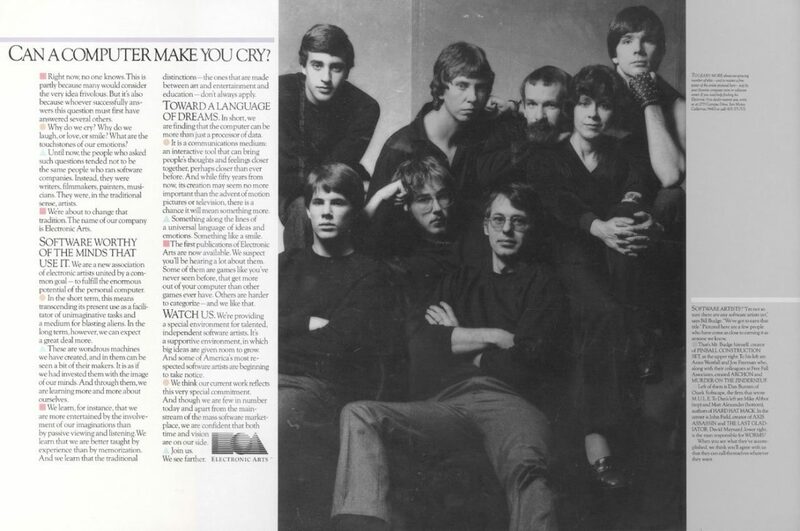 Few people genuinely believed that there would ever be a computer game that could make people feel actual feelings. Floyd the Robot was the closest that we had gotten for a long time. The pursuit seemed futile. Graphics were too primitive to access the visual senses in the same way as Real Art. Memory restrictions put hard limits on how complex stories could be, removing them from the same sphere of influence as books. Music was largely beeps and boops, lacking even the basic emotional resonance of your average Michael Bolton song. For all that games could do, it seemed like they couldn’t do anything well enough to access our tear ducts. Fast forward a few decades, and I have a list of games that have genuinely made me weep at my desk. There are songs from Life is Strange that make me tear up from the first few bars. Every time I think of Clementine and the last episode of the first Walking Dead game I get choked up. Mordin’s sacrifice in Mass Effect 3 was one of the reasons why I refuse to be drawn into the weirdly obsessive group of people calling that game a disaster. We know video games can make us cry. In one respect, obviously they can – we play games with people, and people can make us cry with distressing regularity. That’s something outside the scope of the game though. 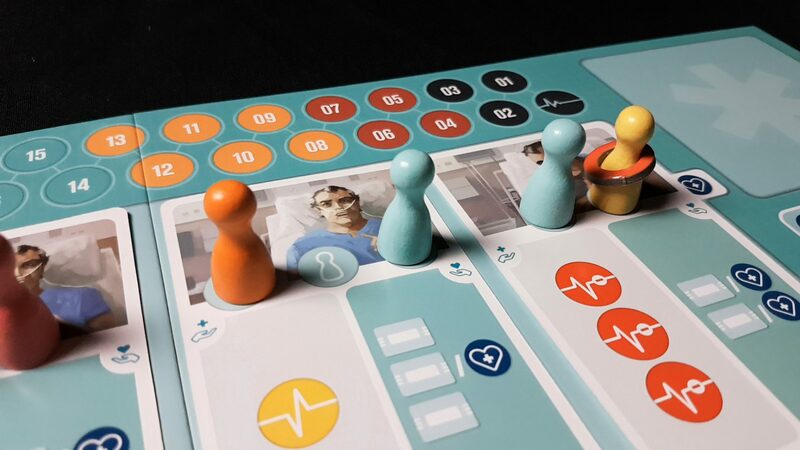 Can board games themselves be designed in such a way that makes them sufficiently deep, sufficiently involving, that we are stirred to passions greater than a desire for analytical optimisation? Can we ever feel enough from a board game to leave us changed as a result? 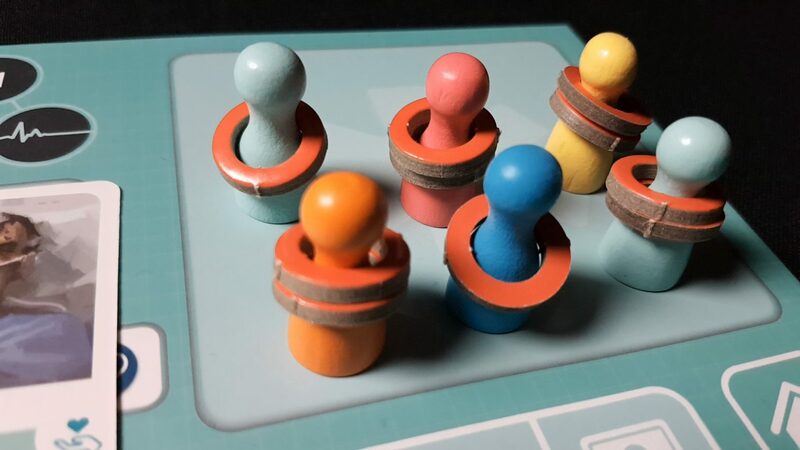 Holding On is the game that has come closest to accomplishing that for me, and while I might not ever play it again it has brought up thoughts, feelings and memories that until recently I would have said fell well outside the sphere of competence of the hobby. 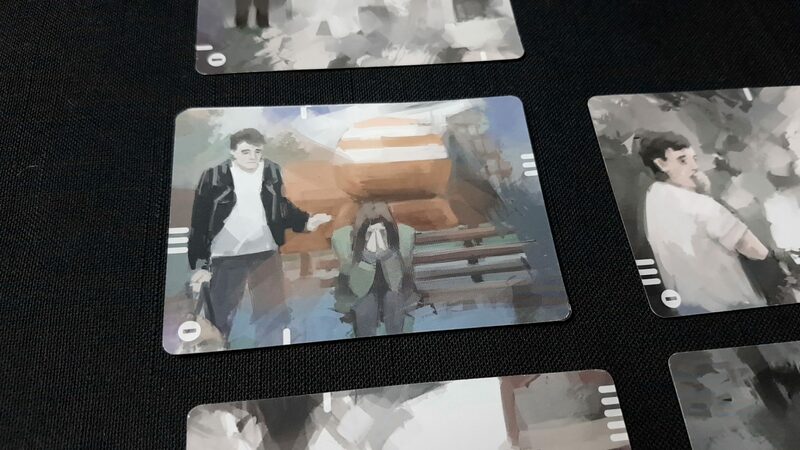 I’m not sure that Holding On is a game that I’d say answered the question of ‘can a board game make you cry’, but it certainly made me ache in a way that surprised me. It pushed aside twenty years with the draw of a few cards. I spent several years after my father’s death trying to forget the pain, until it become such second nature that I forgot that pain was still there. We never get rid of the pain of loss though. We just get better at living with it. We honour the treasured dead by carrying them with us forever. It turns out that I still miss my father and twenty years isn’t enough to change that fact. It’s not that I had forgotten that, because it’s not the kind of thing that slips your mind. Holding On though made me actively confront the truth that I spend a lot of time trying to pretend I don’t remember. I don’t know if receiving this insight is a good or a bad thing, not yet. It’s a thing though that shows that board games can be capable of more than we might expect if we’re willing to risk things getting a little raw in the process.